A full colour map featuring the Leeds and Liverpool Canal, the Aire & Calder and the Calder & Hebble Navigations, suitable for both waterways and leisure users. 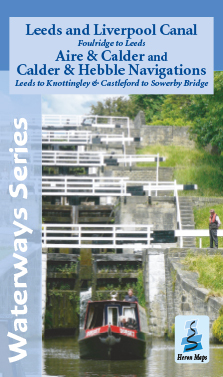 This map gives detailed coverage of the Leeds and Liverpool Canal, from Foulridge to Leeds, the Aire & Calder and Calder & Hebble Navigations from Leeds to Knottingley and Castleford to Sowerby Bridge with emphasis on the waterways and information useful and relevant to users of the waterways without neglecting other leisure users. The map detail is complimented by information panels and photographs. The Leeds and Liverpool Canal is a popular cruising route and although a lengthy canal to navigate or explore all in one visit, the settlements, canal features and ever changing landscapes along its route make it worthy of return visits by boat, car, bicycle or on foot. As with many of the canals on the system it is a canal of real contrasts, in places it is quiet and tranquil, in others vibrant and bustling. The canal skirts the Yorkshire Dales National Park near Gargrave, offering some of the most picturesque views anywhere on the network. It passes Saltaire, a World Heritage Site and at Bingley there's the stunning Bingley Five Rise Locks considered one of the Wonders of the Waterways. From Leeds city centre the Aire & Calder heads past the regenerated Leeds Dock, home to the Royal Armouries Museum, south to Castleford. At Castleford Junction the main line heads eastwards to the port of Goole, via Knottingley (the extent of this map), whilst the Wakefield Branch heads westwards to Wakefield. Both the Aire & Calder and Calder & Hebble Navigations were originally rivers that were significant changed with numerous cuts to make them more viable for commercial traffic. It is due to the commercial nature of the waterway that the locks on the Aire & Calder are 200ft (61m) long. The Calder & Hebble runs for 21 miles between Sowerby Bridge and Wakefield, along alternating stretches of river and cuts. Places of interest include the waterside Hepworth Gallery in Wakefield, the basin at Sowerby Bridge with fine canalside buildings, covered docks and home to Shire Cruisers, Brighouse with interesting shops and buildings and split level basin, Salterhebble Locks featuring one of the very few functioning guillotine locks and a short arm into Dewsbury. The Calder & Hebble connects at Sowerby Bridge to the Rochdale Canal and at Cooper Bridge Junction with the Huddersfield Broad Canal trans pennine waterways. A tourist map of the Leeds and Liverpool Canal and Aire & Calder and Calder & Hebble Navigations at 1:50,000, with detailed town plans of Skipton, Bingley, Leeds, Wakefield, Mirfield, Brighouse and Sowerby Bridge at 1:12,500. The Leeds and Liverpool Canal and Aire & Calder and Calder & Hebble Navigations map is available to buy online or by telephone from our business partner, Guidepost. Click on the logo below to visit their store.